Hoagies' Gifted Education Page introduces our new Blog Hops! What's a Blog Hop? It's a chance for bloggers to get together and talk about a specific topic, and a chance for readers to hop around from blog to blog, getting different perspectives on that topic. When our girls were preschoolers, we enjoyed hopping around the parenting blog hops. And now, we enjoy Hoagies' very own Blog Hops! Are you a blog author who wants to join our Blog Hop? It's easy! E-mail us at HoagiesGifted.org. We'll add you to our Blog Hop group, where you'll find everything you need to know. Hop in with us, and join us for our 2018-2019 Blog Hops! Join our Blog Hop Authors team, and help decide future topics! Special Populations in Gifted Education. 2e Gifted. LGBTQ Gifted. Late Blooming Gifted. Learn more about these special gifted populations! Gifted is a severe minority population, consisting of between 2.5% and 10% of the population, depending on which definition you subscribe to. Gifted individuals are often marginalized, said to "have too much" or to "need nothing." Underachievers. Who are they? How do you identify them, or are you misidentifying them? What does underachievement mean to you? Is it the gifted child who refuses to achieve in school? Is it the child who writes amazing stories, perhaps books, but refuses to write his 5-paragraph essay homework? Is it the gifted adult who never got a college degree? The lawyer, a member of the bar, respected in their practice, who chooses to stay home and raise their children? Things I wish I knew back then. Join those of us who've been around the block for a while, to learn what we wished we'd known! Wish you'd done something differently? Glad you did something you did? Not sure what would have been better, but you'd love to arrive at today in a different set of circumstances? Ages & Stages, Redux. Two years ago, we discussed many of the stages; today we discuss a few more. Gifted kids give us a run for our money, no matter how old they are, or what stage they're in...this week. Whether you're dealing with the toddler "little lawyer" who doesn't miss a trick, or the high schooler looking towards dual enrollment, middle-age however you define it, or gifted elders, the Ages and Stages of giftedness are never boring. Philosophical/Spiritual Anxiety. Asynchronous development means many gifted kids understand the finality of death and the afterlife before they're emotionally ready to handle it. It means the news is devastating because our kids (and us, as adults!) are understanding too much and struggling with the weight of the world. Gifted kids are often unwilling to believe in mythical creatures - Santa Claus, the tooth fairy, the Easter Bunny, and others. As adults, Philosophical or Spiritual Anxiety may lead us to spiritual quests, seeking spiritual communities, and suffering / enjoying spiritual sensitivity. What does Philosophical/Spiritual Anxiety mean to you? Balancing Boredom and Burnout. Gifted kids need variety and challenge, but they need "down time," too. How does your family balance that fine line between too many activities and not enough? Is there a magic formula that works for you? How about in the classroom? How do you, as a teacher, advise gifted kids to slow down and "smell the roses," rather than fill thier days with Academic Team, school play, choir, band, orchestra, sports, ...? Executive Function (EF) Skills. We all want 'em, but who's got 'em? How did we grow them? And how can we shared them with our gifted, organizationally challenged gifted kids?? Join the Hoagies' Gifted Blog Hop team for lots of great ideas, whether your gifted child is a preschooler or a post-schooler (a.k.a. adult). You can always improve Executive Function Skills! Child Activists - Supporting Gifted Idealist Children! You know the child who runs a bake sale to save the tigers, or the child who collects PCs and refurbishes them to donate to low-income families, or the child who raises money to provide solar chargers to remote villages in other countries... How do we support our budding idealists? How do we guide them, and take there concerns for real? This is the best gift we can give them! Emotional Intelligence. To some of us, this means everything, the all-encompassing social/emotional development of the gifted individual. To others, it means nothing except an excuse schools use to decline to educate our gifted children, ignoring their academic needs as an aside. What does Emotional Intelligence mean to you? Read this month's blogs and I'm certain you'll find one or many that resonate with you. April's blog hop is on Forming Gifted Groups, for young and old, for parents and individuals...so many questions along the way. Why do we need them? How do we form them? How can we maintain them, and keep them positive and forward-thinking? Gifted support groups. They ARE all their cracked up to be! What gifted groups would YOU like to be a part of? Surviving the Holidays with a House Full of Gifted Folks! The holidays bring school breaks and family time, and we love the hours spent with our friends and relatives and all the kids. But sometimes... those large gatherings in small spaces bring along stress. And while this was written for the holidays, these great hints will serve you as well in your family picnics, celebrations, and holidays, no matter what time of year they occur! Ages & Stages of Giftedness. Giftedness looks unique across the lifespan, yet most of what you find on the subject addresses the K-12 school years. But are we any less gifted as toddlers? As adults? As parents? As senior citizens? Giftedness affects every part of our human development. Join us to explore those ages and stages! How and When to Ask For Help. So many things happen with our kids, our students, older family members, and even ourselves, that make us think, "Is this normal?" Good question! When should we ask for help, and when should we just "let it ride..." And how and where and to whom should we, could we, ask for help? How can you identify the 2e child? What flavors of 2e kids are there? How does the 2e child fare in traditional school? In homeschooling? What challenges face 2e adults? Recommendations? What tips and tricks help the 2e child, their parents, teachers, and other professionals, to accomplish all that they are capable of without frustration and struggle? Acceleration: It's not just about speeding up! According to A Nation Deceived, there are at least 13 kinds of academic Acceleration, from early entrance (to kindergarten, middle school, high school or college), subject or full grade acceleration, compacting, mentors, and lots more. The last 100+ years of research tells the same story: acceleration of gifted students is a good thing. The worst result research reports is that some forms of acceleration aren't bad. The best result includes positive growth for the academic and social/emotional well-being of the gifted child. What does Acceleration mean to you? Good or bad? Were you accelerated as a child? Were your children accelerated? How does it affect the teenage years? ...adulthood? Welcome to the world of gifted acceleration! We'll start this year's Hoagies' Gifted Blog Hop with a tough topic... Testing. Testing means so many things. In this era of annual testing, it means those public school achievement tests that take weeks and months away from our kids' instructional year, much to the dismay of kids, parents, teachers, administrators... just about everyone. But with gifted kids, testing can also mean high-stakes IQ tests that do, or don't, qualify our kids for the "gifted" program or school... whether it suits our kids or not. To homeschooling parents, testing may bring up feelings of it being unnecessary. Homeschoolers already meet their kids instructional needs, so why test at all? Then there are our 2e kids, to whom testing can mean the difference between diagnosis and folks understanding and supporting them, or folks calling them "lazy" or "unmotivated." Testing is a loaded topic! Fall brings school, and school brings Gifted Advocacy. We find ourselves advocating for our gifted children in many places. We may be in school, talking to the teacher and administrators. We may be in the community, signing up for a camp or afterschool program. We may be advocating with our pastor or our neighbor, in the grocery store line or at the soccer game. We may even find ourselves advocating for ourselves, as gifted adults. Gifted advocacy comes in many colors and flavors... where do you find yourself advocating? Friendship. One word that has many meanings. For most kids, friends are those they play with. But for the gifted child, friendship is often far more than that. Gifted friendships can be more complex, more deep, and more difficult to find. Visit our August 2014 blog hop, where we take on Gifted Friendships, charting the waters and traveling the seas as they affect gifted children and adults! For July 2014, we turn our attention to Summer Reading. Summer reading means so much more than a reading list sent home from school. It might mean "mind candy" reading, just to escape from the summer heat. Or it might mean non-fiction reading, and hopefully spending time doing the things you learn. For some kids, summer reading, like school-year reading, is still a struggle; gifted kids may have these struggles too, and we can support and help them. Reading should be fun for everyone... and with graphic novels and books on tape in our modern repertoire, it can be! In June 2014, just in time for summer, we Hop on Gifted @Play. What does "play" mean to gifted kids? What kinds of play are best? Indoors or outdoors? Structured or free-play? Creative play using tools such as Lego, Kapla or Zome? Exploring nature through geocaching, or exploring gravity through old-fashioned playground equipment? What kinds of play are favorites of gifted kids, teens and adults? What kinds of play can gifted families do together? Play is important to us ALL! In May 2014, Hoagies' Gifted Education Page introduced our very own Blog Hop with our first topic: The "G" Word. Bloggers from all corners of the gifted community--parents, teachers and counselors--join us to share their perspectives. The "G" Word. Gifted. What does it mean to you? What does it mean to others? Is it good? Is it bad? Should we use it? Change it? Read on to see what over two dozen Hoagies' Blog Hop bloggers think and feel! Thanks to all our bloggers for opening up this conversation. If you'd like to join in our Hop, contact us at carolyn@hoagiesgifted.org. Special thanks to Pamela S. Ryan for our great Blog Hop graphics! 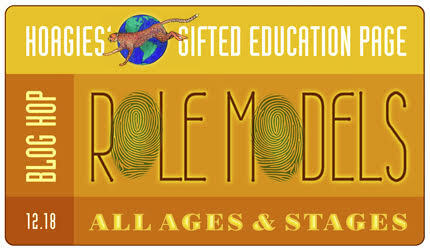 Follow @HoagiesGifted on Twitter, Hoagies' Gifted Education Page fan page on Facebook, or Carolyn K. on LinkedIn. Now on Google+! Different than Hoagies' Page updates, this feed includes timely short articles and links for kids, and brain research and gifted education features for adults and kids!